Riley was found as a stray on Thanksgiving Day by a woman who decided to befriend him and take him in. She discovered quickly that he was blind. She wanted to keep him but her landlord would not allow her to do so. Since then, Riley has been in the care of “A Buddy for Life”, a Delaware dog rescue. He has been to a specialist, Dr. Bowersox at the Veterinary Specialty Center. Riley has been diagnosed with Uveodermatologic Syndrome. US is an immune-mediated disease where the body inappropriately attacks its own pigment producing cells. He has very limited vision in his right eye and none in his left. Riley did have some inflammation in both eyes but with the help of antibiotic drops, they have cleared up. Dr. Bowersox strongly believes that Riley can live a long happy life with this condition. However, he did suggest that his eyes be watched and checked yearly. Although Riley is blind, he has learned to rely on his other senses. He doesn’t allow his handicap to hold him back. He’s a quick learner and it doesn’t take him long to figure out where things are and how to avoid them. 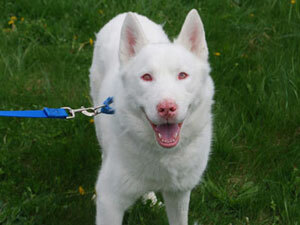 Riley is three years old, housebroken, crate trained and knows several commands. He would do well in a home by himself, or with other dogs that are the same size or larger but NO CATS. He has no issue with children. Due to his limited sight he might be better off with older children than smaller children. This sweet boy is still looking for a forever home that will allow him to give unconditional love back. Riley is a courtesy posting – if interested in knowing more about this amazing dog, please email A Buddy for Life at info@abuddyforlife.org.